If you are a huge fan of medium rare or rare done steak, just like me, then you may wonder if that is the recommended doneness level to eat. You may ask yourself if it is actually safe to eat a rare steak or you should go for a well done instead? 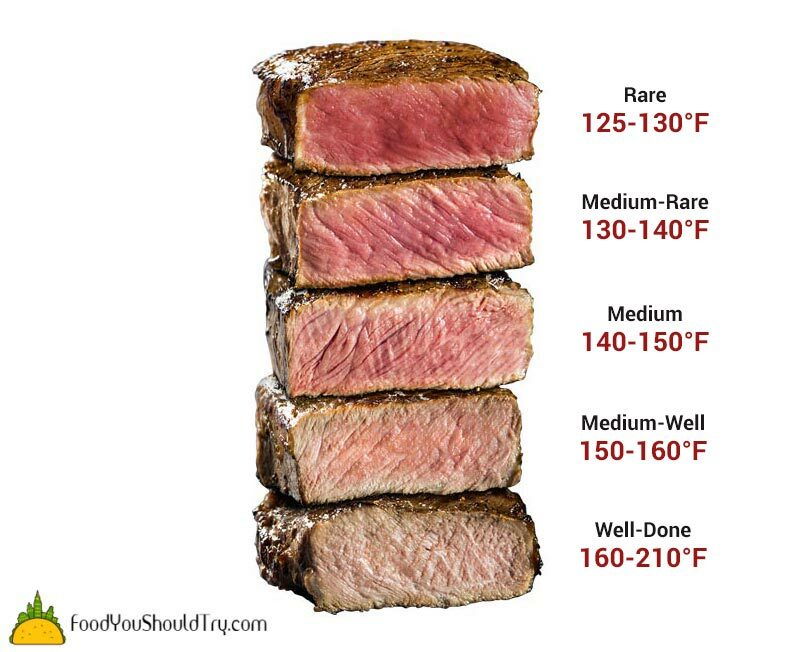 Even though every one of us has different preferences when it comes to food, there is actually a recommended doneness level to cook your steak at. We have prepared a quick all around steak cooking guide and an infographic for you to better understand how to properly cook steak and what is the correct doneness level for it. What are the differences between each steak doneness levels? When it comes to steak doneness, the main difference between doneness levels is the internal temperature of the meat. The internal meat temperature will tell you what the real doneness level is. While in Europe there are 8 total doneness levels for steak, the US has in total six doneness levels: Blue Rare, Rare, Medium-Rare, Medium, Medium-Well & Well-Done. Some cuts of steak are best at specific doneness levels, like Wagyu beef for example, which reaches its maximum flavor when cooked at Rare doneness level. The Blue Rare and Rare are the two entry temperature cooking levels. The Blue Rare is considered when meat reaches 115°F and Rare is considered at 125-130°F. The meat at these doneness level has a very red center, almost raw and a very pink-red color all around. Next, we have the Medium-Rare and Medium doneness levels. These two are the most popular and the most used cooking levels for steaks. They are each reached at 130-140°F for Medium-Rare and 140-150°F for Medium doneness level. Meat at these levels has a warm pink center, with a brownish color around it. Also, these two cooking levels are the best temperature to cook a steak, according to several chefs all around the world. They suggest that at the stated temperatures, the meat reaches its maximum flavor and juiciness, making it very tender and delicious to eat. The last two cooking levels for steak are the Medium-Well and Well-Done. The Medium-Well is reached at 150-160°F and the Well-Done is reached at 160-210°F. The meat has a brown color all around when reaches these cooking temperatures. While some people may prefer their meat at these doneness level, all chefs consider these two doneness level as not good because the meat is overcooked and has lost most of its juiciness, becoming dry and hard to eat. Which is the Best: Medium Rare or Medium? As I stated above, the Medium-Rare and Medium are the two recommended cooking points for a steak. At these doneness levels, the meat has an internal temperature between 130-150°F, which makes the meat fibers very tender, juicy and full of flavor. The other doneness level, either expose the meat to heat for a longer amount of time, making it dry and hard to chew or leave the meat a bit raw and not very tender. Deciding if you should cook your steak at Medium-Rare or Medium is a matter of preference. While there is no big difference between these two, I personally prefer the Medium-Rare level as the steak is juicier and more flavorful. How Can You Spot When Steak is Medium-Rare? The easiest way to spot when your steak has reached the Medium-Rare doneness is by using an instant read thermometer. They are very cheap, easy to use and can be used for any food. I know that there are some high quality gas grills who have a built-in thermometer but the truth is that they aren’t very accurate, especially when it comes to measuring the center of the meat. One useful tip to have in mind when measuring the steak temperature is that the meat will continue to cook for a few minutes after it is removed from the heat, that’s why you should always remove the steak 5° below the target temperature. If you are not planning to get an instant read thermometer, then you can use the alternative hand doneness test to find out the doneness level for your steak. Start by touching your middle finger with the tip of your hand’s thumb. Then, with your other hand, feel the base of your thumb. Compare this firmness with the meat’s firmness. That’s how a Medium-Rare steak should feel like. If you are a beginner, then cooking a steak properly may require some practice, especially if you don’t have an instant-read thermometer and are using the hand doneness test. It doesn’t matter if you are using a grill, smoker or pan to cook the meat, once you get used to identifying the correct internal temperatures, you will easily cook a perfect steak, full of flavor and very tender, each time you are in the kitchen. 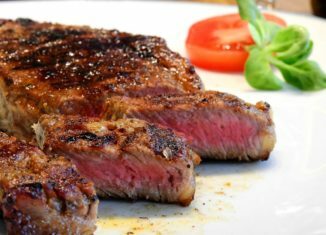 After you read this article, I hope you gained a little knowledge about steak cooking and made you feel a bit more confident for the next you plan to cook a steak.